In order to initiate the integration process of the newly arrived asylum seeker families, the Charity Centre for Refugees (CCR), with support from the Bureau of Migration and Asylum and the UNHCR office in Moldova, organized a Women Group Initiative meeting at the Temporary Accommodation Centre (TAC), where many asylum seekers live awaiting the decision concerning their asylum applications. The goal of this event was to promote the active participation and initiative of asylum seekers, especially women and children, and create a welcoming environment for them. In this way, the women group initiative can be now implemented. The aim of this group is to enable women to be more open for communication and to foster their integration. Due to the fact that they are more liable to be affected by poverty and exclusion, women are considered as being more vulnerable than men. In order to prevent those situations, CCR and its partners organize many activities through the Women Group Initiative. Around 20 refugees and asylum seekers from Uzbekistan, Afghanistan, Chechen region of Russia and other countries, together with representatives of BMA and UNHCR office, participated in this event. After the relevant presentations and introductions, the women used this opportunity to share their concerns, breakthroughs and problems. In the framework of the CCR collaboration with ADVIT, CCR was supported by 2 EVS (European Voluntary Service) volunteers: Clotilde Bruter from France and Yuko Tominaga from Japan. The latter came with the idea of organizing an origami workshop for refugees and asylum seekers that allowed both children and adults to put in practice their creative skills. Origami is a Japanese traditional handcraft, which enables to create various objects from blank paper, only by correctly folding it. 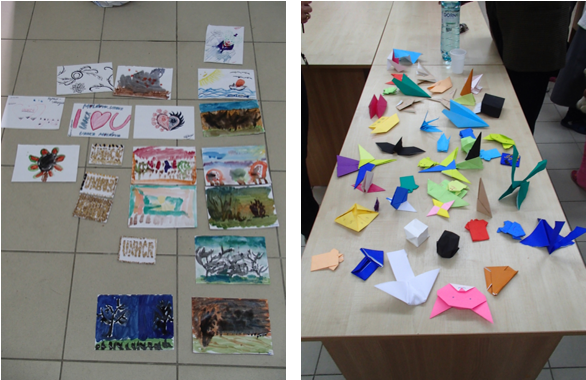 The CCR beneficiaries made various Origami works like birds, balloons and houses using multiple colour papers. Some asylum seekers from Afghanistan already knew Origami and created wonderful ships and planes. Apart from the Origami workshop, the CCR art teacher assisted the refugees and asylum seekers in painting and doing handcraft with seeds (seeds of the sunflower, sesame, etc.) that they glued on the paper, thus creatively decorating various shapes. A tasty light meal closed the activities. This event was successful: refugees all enjoyed doing Origami, painting and using seeds for artistic purposes. The atmosphere was really merry, friendly and comfortable for the persons of concern. CCR will continue to support refugees, especially women, in order to make their lives easier in Moldova and to encourage them to expand their circle of trust and be more proactive.